We visited Cars Under the Stars for this month’s Cars Of Bendix. A monthly event that caters to lovers of old-school metal, the meet was packed to the brim with immaculate muscle and classic cars from all sorts of eras. Experience this blast from the past with our August 2018 edition of Cars of Bendix! Joe’s Volkswagen Beetle is certainly one unique build, as you can plainly see, with seemingly no bolt untouched. The first thing you notice is that the little Beetle’s layout has been drastically changed. Off the factory line, these old Beetles came equipped with a flat-four mounted in the rear. Now that’s all fine and well, but Joe decided that that didn’t suit a hot rodder such as himself. His solution? Move the powerplant to the front and replace it with a 410cin Chevy V8. This alone makes it one of the most unique Beetle’s in existence, but Joe didn’t stop there. Joe added a few race-inspired touches with a big GT wing along with some nicely-bolstered bucket seats and a roll cage. As for the bodywork, the devil’s certainly in the details. Along with that beautiful paintjob, Joe’s widened the fenders, and added a front grill and bonnet vents, giving the Beetle a much more aggressive face – as if it wasn’t menacing enough with that enormous blower hanging out of the bonnet. 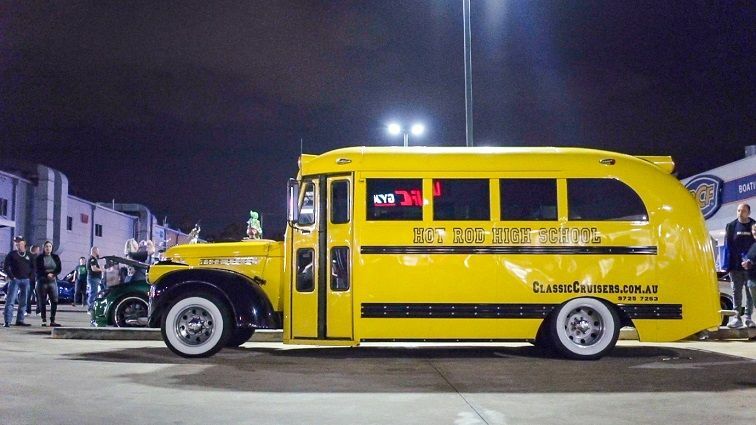 We can’t think of a better way to cruise to your next formal event than in Classic Cruisers’ Hot Rod Bus! As you can plainly see, this ain’t your everyday school bus. Absolutely oozing style inside and out, this unique Hot Rod Bus is a favourite amongst Classic Cruisers’ customers. Completely decked out inside with a mega sound system, bars, mood lights and even a dance pole the Hot Rod Bus is essentially a modern limo inside that classic 1964 bus. But our favourite part? Under the bonnet lies a supercharged 427 V8 singing to the tune of 630hp, so it’s not all about low and slow cruising. Owner and operator at LS Autoworks, Luke certainly knows his way around the revered GM powerplant. 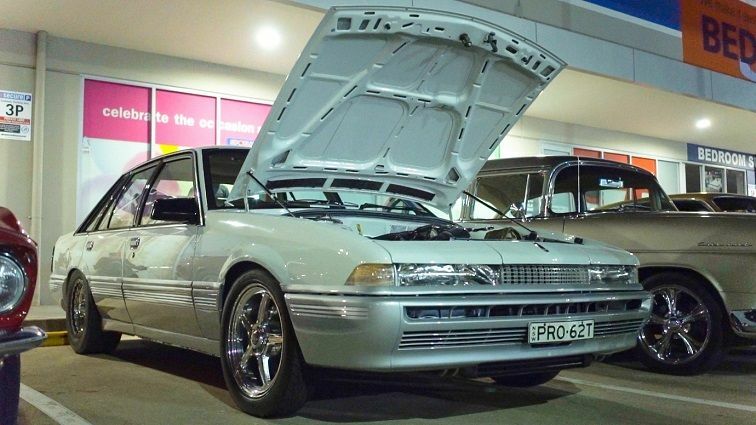 Just one of Luke’s pride and joys, this genuine Holden VL Calais is a perfect example of just what Luke and his shop are capable of. Under the bonnet of the mint VL body lies a turbocharged LS3 fully rebuilt with forged rods and pistons. That monster powerplant gets the fuel it needs thanks to a Holley EFI system and AFI fuel cell. The result is a healthy 850hp at the wheels before the dyno topped out, so you can expect that this beast is capable of a whole lot more. Power is sent to the ground thanks to a race Turbo 400 transmission and a 3.45 ratio Borgwarner diff equipped with a Truetrac centre. Surprisingly, Luke’s also has a fondness for little Honda 4-bangers, something usually unheard of in the world of V8. Luke’s shop is also responsible for the world’s fastest FWD Honda CRX, which we’re certainly looking forward to seeing in the future. When it comes to Australian motorsport legends, the Falcon GT is one of the first that springs to mind. 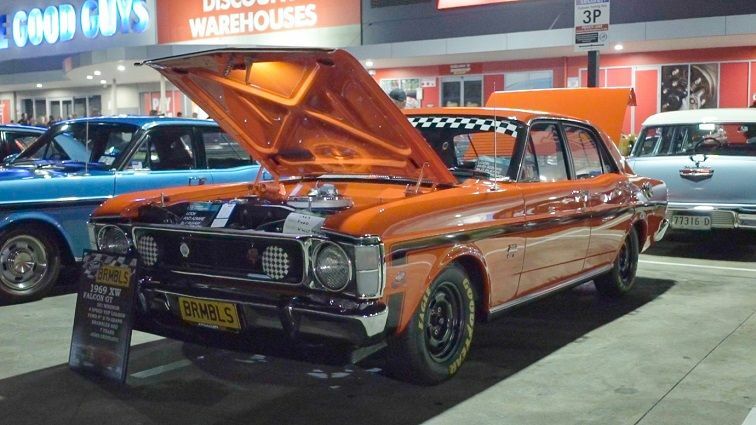 The Falcon GT dominated the Aussie racing scene for years and thus, cemented its place not only in the history books, but in the hearts of Aussie car enthusiasts for years to come. These days, they fetch big money and it’s easy to see why. This particular XW Falcon GT was built as somewhat of a tribute to the Falcon GT race cars of old with subtle touches like the black steel wheels and checkered vinyl scatter in the car. Coated in Brambles red and in absolutely mint condition, the XW GT was certainly a favourite. Looking like it rolled straight of the set of Grease, this Ford Model T was an absolute blast from the past. A sight to behold, this Model T featured beautifully finished airbrushed flame graphics, completely chromed-out engine bay and under-body neon lights. This Model T was far from all show and no go, a fact made evident by the supercharger and enormous blower topping that V8 powerplant. 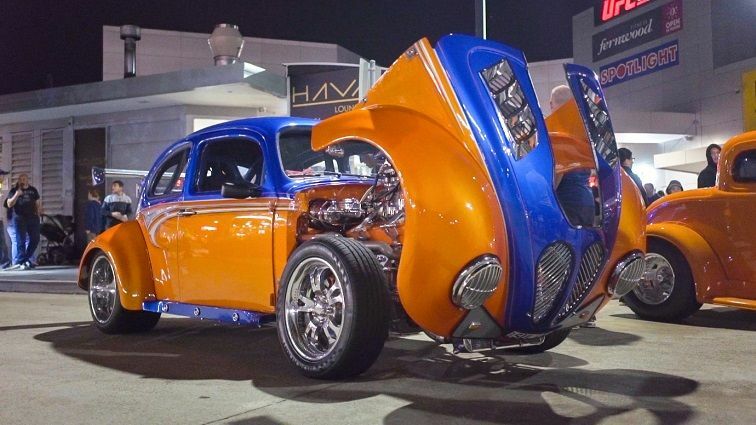 Much more than a nostalgic cruiser, you wouldn’t wanna see this thing rolling up in your rear view! 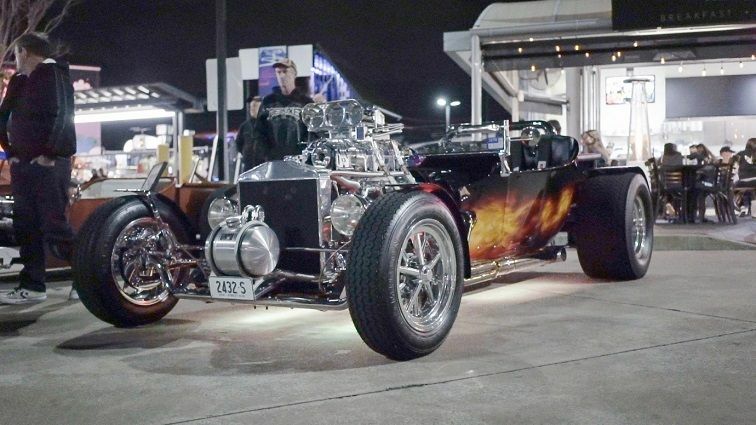 Another throwback to the golden age of hot-rodding, Roy’s 1923 Ford T-Bucket certainly caught our attention. 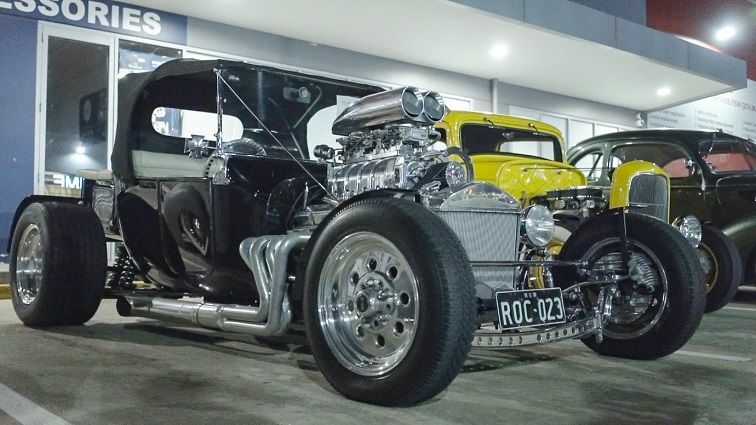 Having been Roy’s pride and joy for more than 10 years, Roy’s kept the hod-rodding spirit alive, bringing his beast to as many shows as possible. As you could probably tell by looking at that beautiful exposed engine bay, Roy’s T-Bucket is packing some serious grunt. With 355 V8 stroked to 359cin and boosted by a supercharger, this Ford T-Bucket puts out an impressive 650hp. Weighing in at only 900kg, that’s more than enough to smoke almost anything else on the road that’s a whole lot newer. 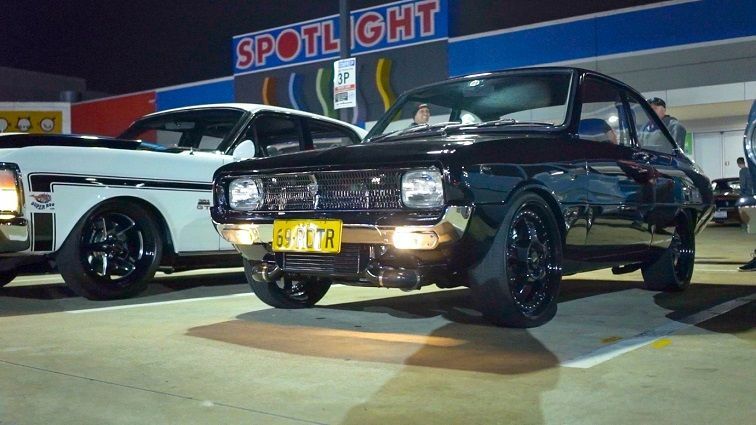 If there’s anything that we can’t get enough of, it’s old-school rotarys, and in a sea of RX3s and RX7s, this gorgeous Mazda R100 was one of the best we’ve seen. Going for an all black theme all-round from the immaculate paintwork, enormous Simmons wheels and even the black front-mount intercooler, this R100 looked positively menacing. Rolling past with that familiar rotary buzz, this little Mazda put all the big V8s on notice. If you consider yourself an Aussie muscle aficionado, then you know just how valuable a genuine GTR Torana is. Michael certainly hit the jackpot, scoring such a rare ride. Not satisfied with cruising around in original form however, Michael took it just that extra bit further, as you can probably tell from the fat rubber and those hinting number plates. Much more than some pampered garage queen, Michael’s Torana was built to tear it up on the quarter mile. With a tubbed rear to accommodate those enormous rear treads and a 2 speed Powerglide transmission, the little Torana puts its power down to the tarmac with ease. Speaking of power, Michael’s Torana has it in spades, pumping out a gargantuan 1000hp from its small block Chevy V8 with the aid of the ol’ happy gas. 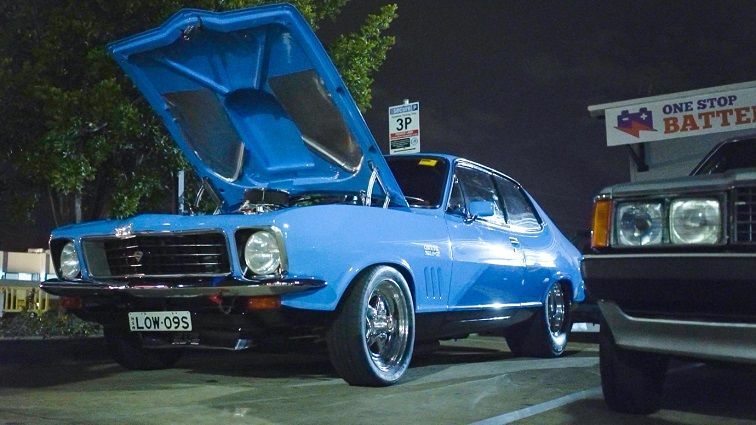 Don’t let the plates fool you, this Torana is actually capable of cracking the 8 second bracket!